Hamilton Academical star Greg Docherty is undergoing his medical at Auchenhowie this morning ahead of a £650,000 move to Rangers, according to the Daily Record. The newspaper claim in their live transfer blog (Thursday, 10:05) that Docherty was scheduled to arrive at the club’s training ground at around 10:30am ahead of his move. The 21-year-old is set to become Graeme Murty’s sixth signing of the winter window, joining Sean Goss, Jamie Murphy, Jason Cummings, Russell Martin, and Declan John, whose loan from Cardiff was made permanent this month. Docherty has been a star for Hamilton since breaking into the first-team as a 17 year old, making over 100 appearances for his boyhood club. He has scored three goals and laid on six assists in 21 appearances this season, with Accies occupying ninth spot in the Premiership table. This is an exciting move for the Light Blues. 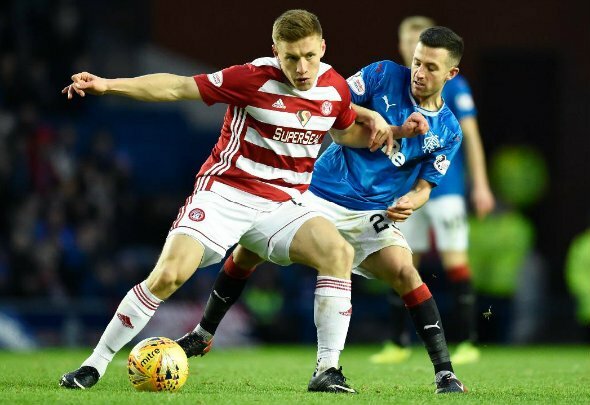 Docherty has been highly impressive in the Premiership with his displays for Accies this season, and the 21-year-old has inevitably caught the eye of the country’s big clubs. An added bonus here is the fact that Docherty is a Rangers fan, and that is always extra motivation to perform. His signing will top off what has been a brilliant January window for the Light Blues, as they have strengthened in all areas under new boss Murty. Barring a problem in Docherty’s medical, expect this one to be completed in the coming hours. All terms seem to have been agreed, and all that is left is for Docherty to be pictured in Light Blue.